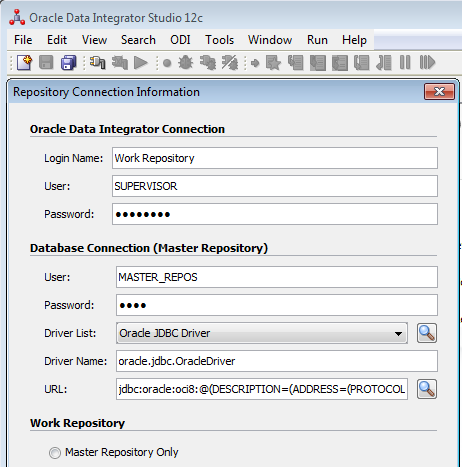 On the same note I use Oracle JDBC Driver ODI driver connection. As the studio does not use the tnsnames to connect to the Oracle instance if you try jdbc:oracle:oci8:@<tns_alias> it will not work. That’s why you can give (DESCRIPTION=(ADDRESS=(PROTOCOL=TCP)(HOST=hostname)(PORT=1521))(CONNECT_DATA=(SERVER=DEDICATED)(SERVICE_NAME=SID))) instead. So far so good but still get the same error.